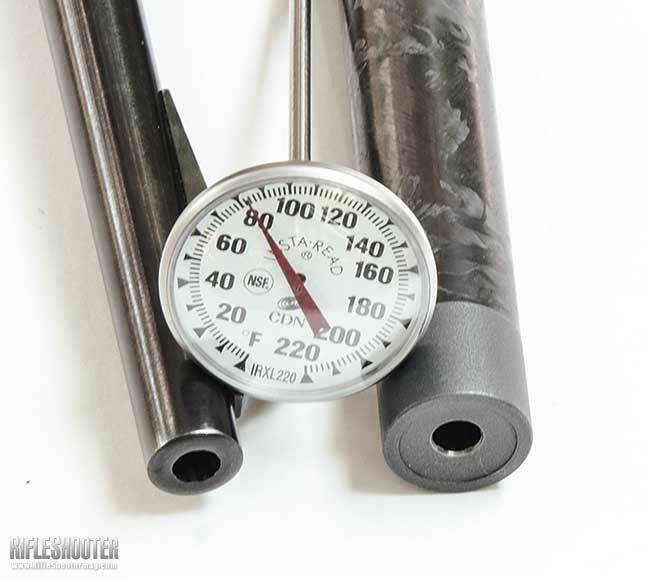 PROOF Research’s carbon-fiber barrels are at the heart of the new Summit rifle. PROOF Research was formed in 2010 by the joining of two companies. One was Jense Precision, a custom rifle building operation owned by master gunsmith K. K. Jense. The other was Advanced Barrel Systems, founded and operated by Mike Degerness, which manufactured and sold carbon-wrapped rifle barrels. Other acquisitions were Lone Wolf Stocks, Lawrence Rifle Barrels and Performance Polymer Solutions, Inc. The firearms division is located in Montana. There’s also an aerospace division in Ohio that, among other exotic things, supplies precision parts to Lockheed Martin for the F-35 Joint Strike Fighter. Of interest to RifleShooter readers are the carbon fiber-wrapped barrels made and sold by the Montana division. Claims made for the barrels include that they are up to 64 percent lighter than an all-steel barrel of the same contour and length, they extend accuracy life through rapid heat dissipation, and the excellent damping qualities and increased stability result in no bullet point of impact shifts during high-volume strings of fire. PROOF Research owns the only carbon-fiber barrel technology to be tested and approved by the U.S. military for use on precision sniper rifles. Simpson fired 20 rounds through the PROOF Research barrel and a standard steel barrel. After cooling for 10 minutes, the steel barrel was almost as hot as the carbon barrel had been immediately after firing. The process begins by turning down a match-grade barrel blank of 416R stainless steel to a much smaller contour. Leaving about 2.75 inches at the rear and 0.75 inch at the muzzle at their original diameters forms opposing shoulders for containing the carbon-fiber wrap. The barrel blank is then filament-wrapped with aerospace-grade carbon fibers. During the wrapping process, the fibers are impregnated with proprietary high thermal-conductivity matrix resins that were developed by the aerospace division. After curing, the exterior of the barrel is ground to its finished contour. The bore is then rifled. Most barrels are cut-rifled, but Proof Research also has button-rifling capability. Depending on a customer’s requirement, the barrel will have a plain muzzle or threaded for a muzzle brake or flash suppressor. Titanium and stainless muzzle brakes are available. The Summit’s receiver is quite similar to the Remington Model 700 receiver except its bridge is shorter and its ring is longer. And like the 700, the two-position safety doesn’t lock the bolt when on Safe. PROOF Research barrels made for bolt-action rifles are available in 11 different groove diameters ranging from .204 to .458 inch. Contour options are Sendero and Sendero Light; the latter is 4.5 ounces lighter. AR-10 and AR-15 barrels are offered in medium (.750 inch) and heavy (.875 inch) contours with, depending on caliber, rifling twist rates ranging from 1:7 to 1:10. The AR barrel comes already chambered for one of seven different cartridges while those for bolt guns are left to be chambered by the gunsmiths who fit them to actions. Barrel prices range from $900 to $940. PROOF Research’s Montana division is primarily a manufacturer of carbon-wrapped barrels, and for this reason, management does not treat the rifle-building part of the operation as a primary profit center. Approximately 300 high-end rifles are built each year, mainly because doing so provides a better understanding of what gunsmiths and OEM customers require. Building rifles around top-quality actions and stocks also supports research and development initiatives and offers a platform from which the performance of the company’s carbon-fiber wrapped barrels can be demonstrated. The bolt incorporates an anti-wobble groove in the right-hand locking lug that engages a track in the receiver, and the handle is integral with bolt body. It features a Sako-style extractor and plunger-style ejector. 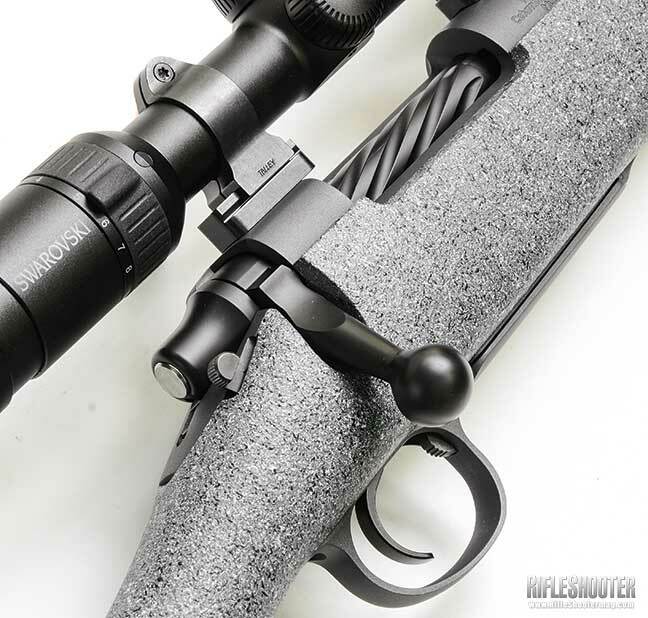 The precision-machined action made by PROOF Research is quite similar in appearance to the Remington Model 700 action. This comes as no surprise since gunsmiths around the world have probably built more precision rifles around blueprinted Model 700 actions than any other action. The most noticeable difference is the receiver ring of the PROOF Research is longer while its bridge is shorter than the Model 700’s. The bolt release is positioned on the left-hand side of the receiver bridge. The 4340 chrome-moly bolt body is pure Model 700. It has a plunger-style ejector and a rib on the side of the right-hand locking lug that engages a track in the receiver for reducing angular bolt play. The ejector position in the bolt face is at nine o’clock. The bolt also has a Sako-style extractor. 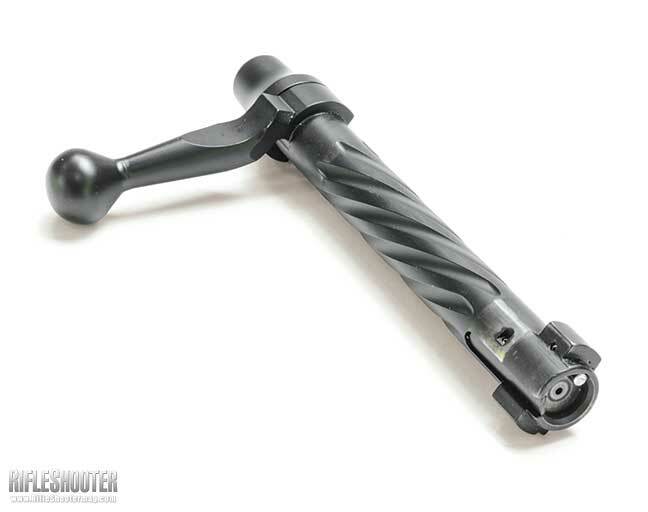 The bolt handle is an integral part of the bolt body and not made separately and then attached. Threading the handle for acceptance of a knob allows the installation of different shapes for hunting and tactical rifles. The washer-style recoil lug sandwiched between the barrel and the receiver is 0.3-inch thick and machined rather than stamped. A Timney trigger is standard. (A Jewell trigger is an option at extra cost.) The Timney on the rifle I shot broke at an average of 33 ounces with only an ounce of variation. There was no detectable creep or over-travel. The safety does not lock the bolt from rotation, allowing the rifle to be unloaded while the safety is engaged. Simpson isn’t totally sold on the Summit’s technology as it relates to a typical big game rifle. However, he sees a real advantage in applications such as heavy duty sniping in hot weather, AR-15s in 3-Gun competition and fast-action varmint shooting. Three models—Summit, Terminus and TAC II— are offered, and each is available with a short, medium or long action. As mentioned, barrel contour options are Sendero and Sendero Light with optional lengths of 20, 22, 24, 26 and 28 inches. With a five-pound, 11-ounce rating, the PROOF Research Summit is the lightest of the trio and is available with a right- or left-hand action. It and the Terminus—which is a heavier hunting rifle, weighing six pounds, 13 ounces—come with a BDL-style, trigger guard/hinged floorplate assembly. The one on the early production Summit I shot was Remington factory in aluminum, but I am told they are now made in Montana of steel. The TAC II rifle weighs eight pounds, 11 ounces. It is available with right- or left-hand action with a detachable box magazine or the BDL assembly. Its stock has a height-adjustable comb. An integral Picatinny rail on the TAC II and Terminus receivers is machined on a 20 m.o.a. incline. In addition to the chamberings listed for the Summit in the specifications chart, the Terminus and TAC II models are also available in .300 Rem. Ultra Mag, .338 Lapua Mag., .338 Norma Mag. and .338 Rem. Ultra Mag. 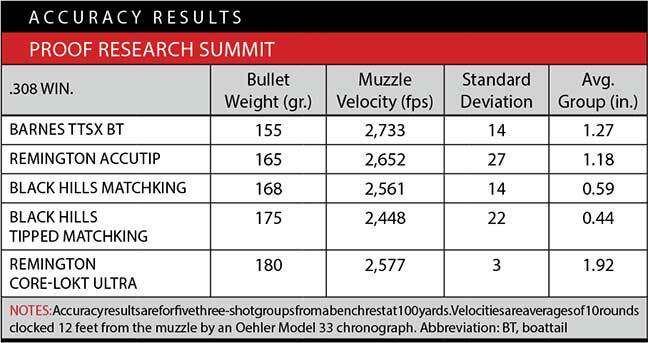 The Summit I shot for this report had a 20-inch barrel in .308 Win. and weighed exactly six pounds. 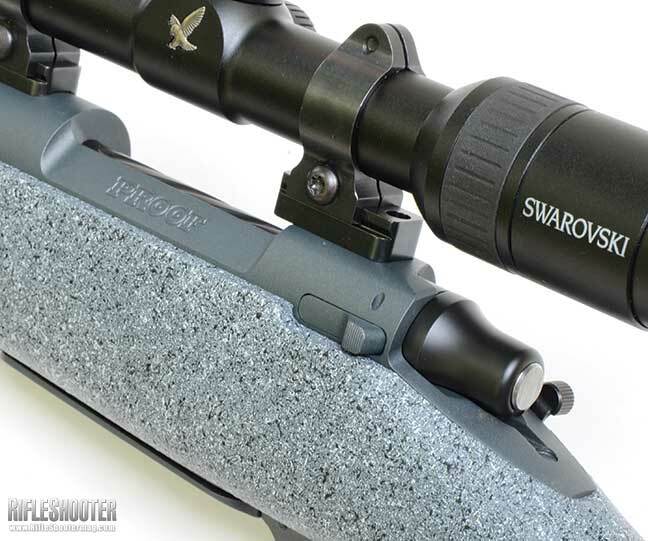 Attaching a Swarovski Z3 3-10×42 scope with a Talley two-piece mount and filling the magazine with four cartridges increased the weight to 7.25 pounds. Attention to important details is quite evident. The PROOF Research Summit is definitely top shelf in every way. For example, both locking lugs bear evenly on their shoulders inside the receiver. The extremely high quality of the 23-ounce, carbon-fiber/Kevlar composite stock is in line with the rest of the rifle. Stock-to-metal fit is excellent, and the finish of the stock flawless. The receiver rests atop aluminum pillars with the barrel floating free over its entire length. The Summit’s bolt release is on left side of receiver bridge. The receiver is drilled and tapped for Talley scope mount. Stock-to-metal fit was excellent. You can have the stock with or without a Monte Carlo-style comb and choose from 13 colors. The shape of the stock and its cushiony Pachmayr Decelerator pad made a lightweight rifle quite comfortable to shoot from the bench. 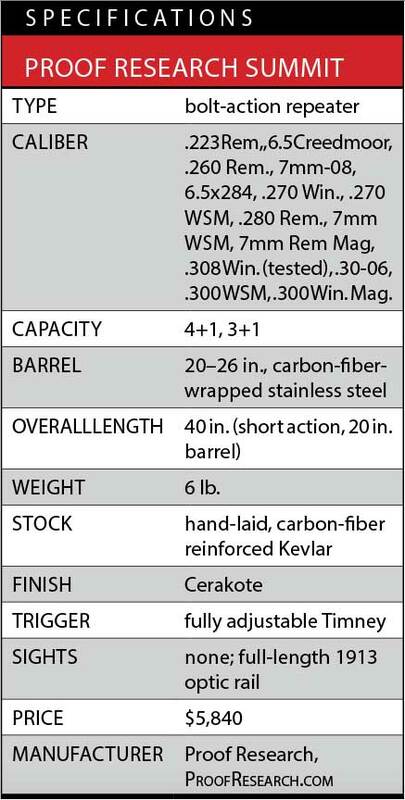 I was curious to see how the weight of a PROOF Research barrel compares with all-steel barrels of various lengths and contours. According to a company spokesman, a 22-inch barrel in .308 Win. weighs 2.73 pounds. That’s about the same as for a 24-inch barrel made by Remington for the 7mm Rem. Mag. But the PROOF Research barrel is much larger in diameter. The Remington barrel measures 1.20 inches at the receiver and tapers to 0.66 inch at the muzzle. The Proof Research barrel is the same diameter at the receiver but measures 0.96 inch at the muzzle. The closest all-steel barrel contour I could find was the Douglas silhouette weighing 4.5 pounds. It is .010 inch smaller at the muzzle but two inches longer than the Proof barrel. The Winchester Model 70 Featherweight (my favorite contour for building a lightweight rifle in a non-magnum caliber) weighs about two pounds. Adding comparisons in barrel stiffness brings the picture into better focus. According to Proof Research, the stiffness coefficient for the company’s carbon-wrapped barrel is six times greater than for a steel barrel of the same length and outside contour. This would make the Proof Research barrel more than six times stiffer than a Douglas Heavy Target barrel weighing almost two pounds more. It is possible to make a carbon fiber wrap with a number of different properties. It can be an insulator capable of retaining heat or it can be a rapid conductor of heat. The process patented by PROOF Research is highly conductive, and its ability to rapidly dissipate heat can prolong the accuracy life of a rifle barrel. There are more sophisticated ways of demonstrating the ability of a barrel to shed heat, but I used a cooking thermometer with a 10-inch probe. Ambient temperature that day was 84 degrees. After quickly firing 20 rounds of .308 Win. through the PROOF Research Summit rifle, I immediately inserted the thermometer into its bore from the muzzle and got a reading of 178 degrees. After 10 minutes it had cooled to 134 degrees. When the test was repeated with an all-steel barrel in .308 Win. with a muzzle diameter of 0.62 inch, the thermometer indicated 216 degrees. Ten minutes later it was 161 degrees. So even after the all-steel barrel had cooled awhile it was still almost as hot as the carbon barrel immediately after being heated up by 20 rounds. All PROOF Research rifles are guaranteed to shoot three shots inside half an inch at 100 yards with match ammo. 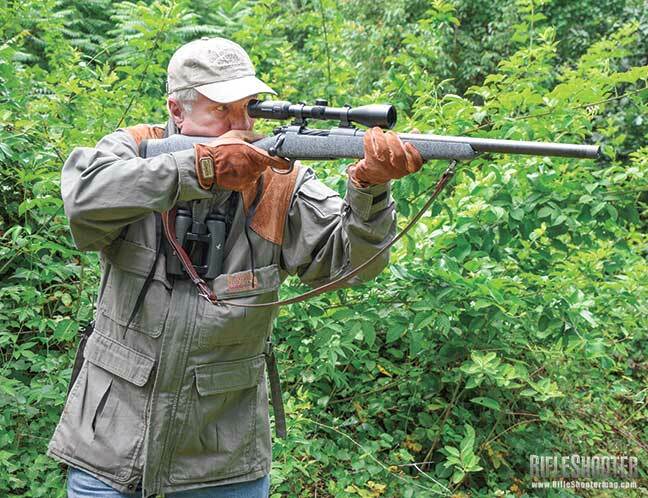 The Summit lived up to its billing with Black Hills ammunition loaded with the Sierra 175-grain Tipped MatchKing and came close enough with another match load. To see if the rifle would pass the no-wandering, point-of-bullet-impact test, I also fired five-, 10- and 20-shot groups. All were quite uniform with no climbing of shots or flyers as the barrel heated up. Group size increased with the number of rounds fired, but some of it could be due to shooter error as I was squeezing off rounds quite rapidly. When viewed through the Swarovski at 10X, heat waves off the PROOF Research barrel became noticeable at about the 10th shot and were interfering a bit with aiming at one-inch squares on the targets prior to reaching 20 rounds. That also could have increased group size a bit. At any rate, averages with the more accurate Black Hills load were 0.61 inch for five shots, 1.18 inches for 10 shots and 1.71 inches for 20 shots. Not bad for a six-pound rifle. Shooting the PROOF Research Summit convinced me that unless a hunting rifle is chambered for a cartridge with a huge appetite for powder, such as the 7mm STW, .300 Ultra Mag and .338 Lapua, a carbon-fiber barrel makes more sense on rifles that are often subjected to high rates of sustained fire. That’s where a shooter will realize the full advantage of a barrel capable of shedding heat quickly. An AR-15 used in 3-Gun competition is an example. Another is a rifle used for long-range sniping on a desert battlefield where ambient temperature greatly exceeds 100 degrees. 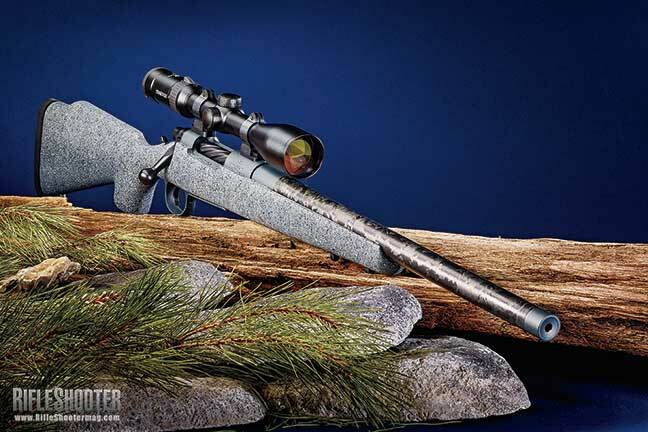 Or in the varmint fields—a TAC II with a 28-inch barrel in .204 Ruger or .223 Rem. just might be the ultimate prairie dog rifle.